Jordanian official says security cameras on Temple Mount should be installed within days and the footage streamed live online. Jordan wants the new surveillance cameras on the Temple Mount to be installed within days and the footage to be streamed live online, The Associated Press (AP) reported Tuesday. The plan to install security cameras on the compound was announced on Saturday by Secretary of State John Kerry, who said that Israel had agreed to the 24-hour surveillance as a step to calm tensions over the Temple Mount. Kerry added that Prime Minister Binyamin Netanyahu had agreed to "an excellent suggestion by Jordan’s King Abdullah to provide 24-hour video coverage of all sites" in the compound. Under the compromise brokered by Kerry, video cameras are to be installed inside the walled platform to help defuse tensions. 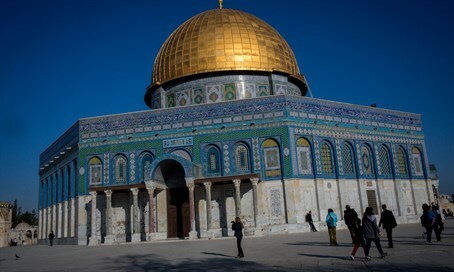 The details are to be worked out between officials from the Waqf, which is the site's administrator, and Israeli authorities, a senior Jordanian government official, who spoke on condition of anonymity told AP on Tuesday. The official said he expects the cameras to be installed in "days, not weeks" and added that both Muslim clerics and Israeli officials will for now monitor the images, but that "the ultimate goal is for the footage to be seen on the Internet, by everyone." Israeli officials confirmed the plan to AP, and in a statement, Netanyahu's office said it hopes to start the process "as soon as possible." The Jordanian official gave no indication that the kingdom was suspicious of the security camera plan, as was reported earlier on Tuesday in a Jordanian newspaper. Jordan’s minister of Islamic Affairs for the Waqf, Ha'il Abed al Hafez, had criticized Israel's involvement in the placement of cameras on the Temple Mount, claiming that the neutral interference of “professional bodies” Israel promised could not be trusted. "The installation of cameras must be done under the supervision of the Islamic Waqf," Hafez claimed to Jordanian paper A-Dustur. "The Hashemite Kingdom has custody of the holy places in Jerusalem, and the Israeli occupation should not interfere." Netanyahu has insisted that the cameras "are in Israel's interests," despite intensive criticism both over the decision to continue a ban on Jewish prayer at the holy site and suspicion that Jordan and the Palestinian Authority (PA) would exploit the cameras for their own interests. The Temple Institute, in particular, warned in an Arutz Sheva interview this week that the placement of CCTV cameras panders to the "Islamist narrative" regarding the Mount, including claims the site is holy to Muslims, that "settlers" are attempting to conquer the site, and that Muslim control over the Mount is a given.